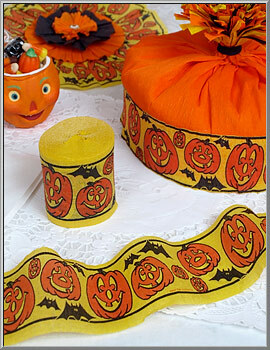 Happy and goofy Jack-O'-Lanterns with not-so-scary bats make this crepe streamer a favorite with the kiddies. 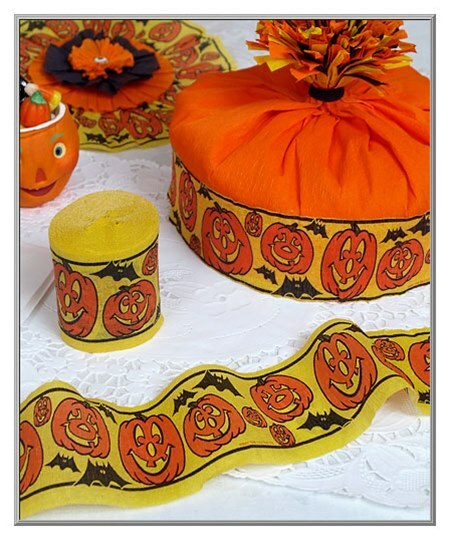 Printed in bright colors, the child-pleasing design of friendly pumpkins makes for a lighthearted crepe frill. Use it to drape over doorways, swag on chandeliers or even make party hats. Crepe paper streamer is bleed, fade and flame resistant. Made in the USA. 2½" wide and 30' long.